$75.00 per person $55.00 for children 5 and under +sales tax and fees. From November until March we operate 7 days a week, 2 trips per day. The morning float begins at 9:30 AM and ends at 12:45 PM. The afternoon float begins at 1:00 PM and ends at 4:00 PM. 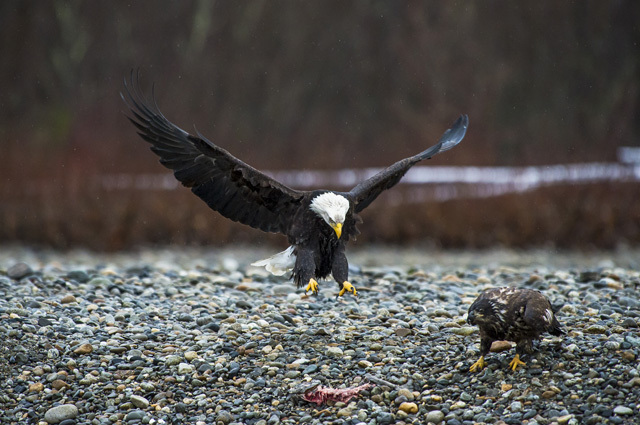 Beginning in November Bald Eagles start showing up for their annual migration from northern Canada and Alaska to feast on the dying fall salmon. 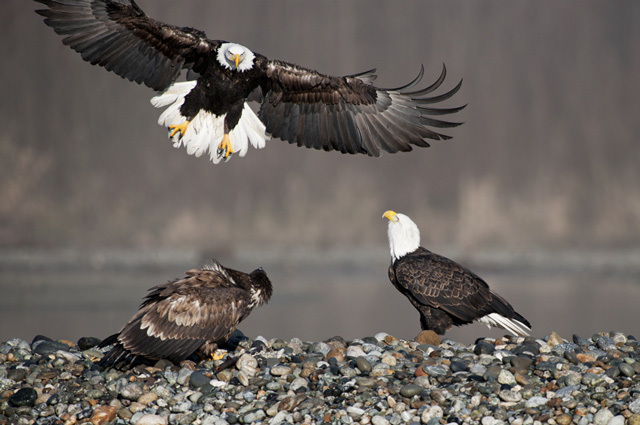 The Skagit is home to the largest concentration of eagles in the lower 48 States. 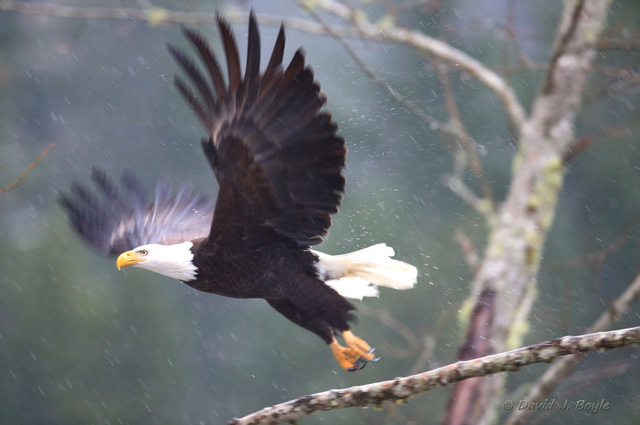 Some years we see up to 500 birds return to our valley, and during the peak of the migration it is common to see 100 to 200 plus birds in a 3 hour Skagit River Eagle Tour. 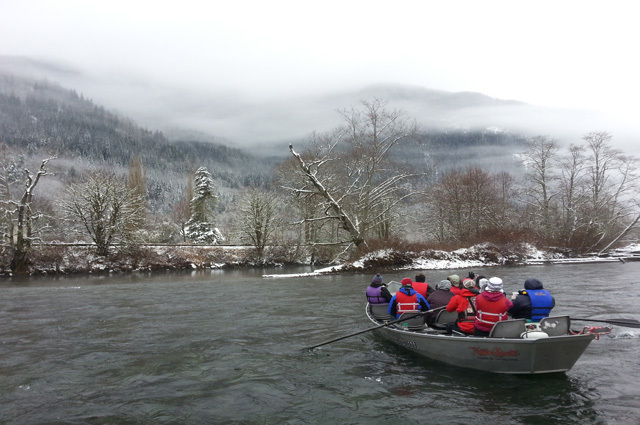 The Skagit has diverse eco system and is one of the most pristine rivers in our state. It is one of the few rivers that has all 5 salmon species returning to it and is world renowned for its Steelhead and salmon runs. 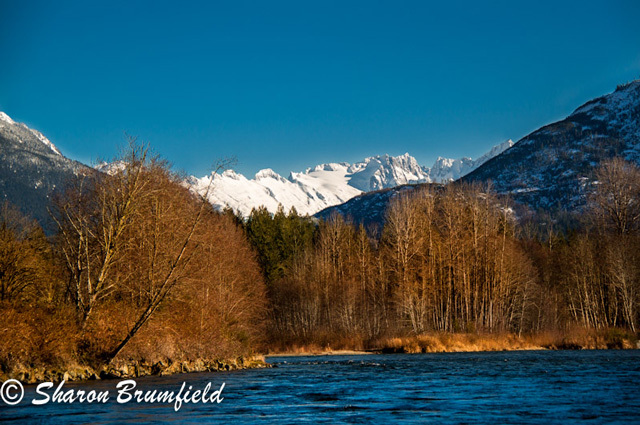 The Skagit is an incredibly beautiful river with majestic Snow capped mountains, lush evergreen trees and abundant wildlife.Reservations are required. Email us or call our toll free number 888 675 2448 to reserve your seats. 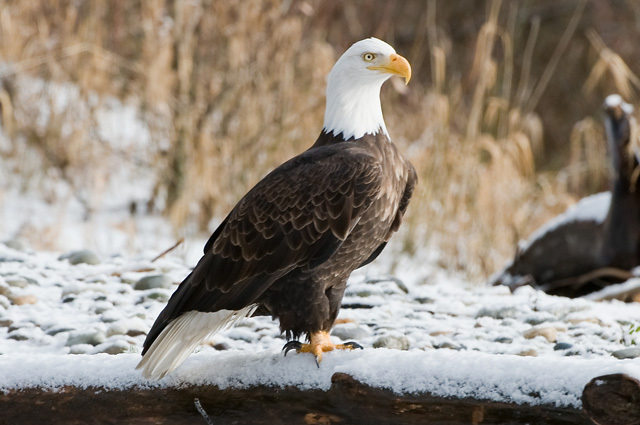 The Skagit Valley is home to Deer, Elk, Bear, Cougar, Beaver and many types of birds and waterfowl. 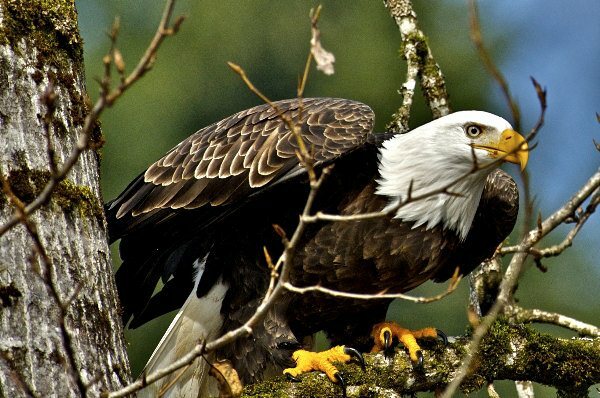 Photo opportunities abound while on the river with breathtaking mountain scenery, large numbers of eagles feeding or perched on tree branches, or possibly a glimpse of some of the big game that is abundant in the forest lining the river. 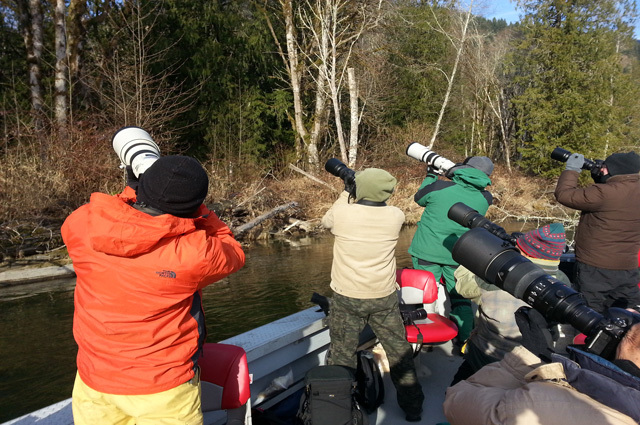 Be sure to view our Skagit Eagle Counts page to see our weekly report on river conditions, number of eagles in the sanctuary and photos of our recent tours. 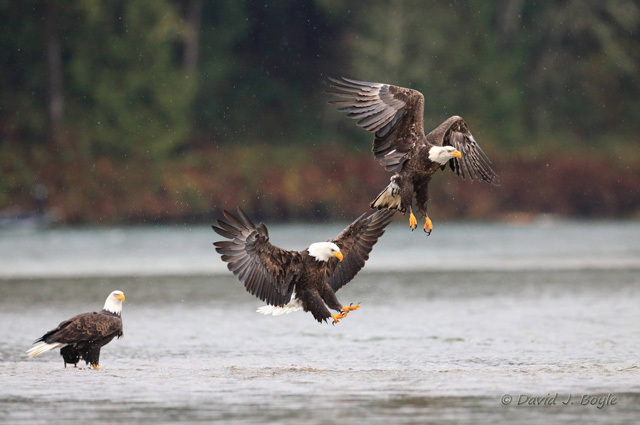 We begin our Skagit Eagle Tours in early October with our Fall Colors Float. 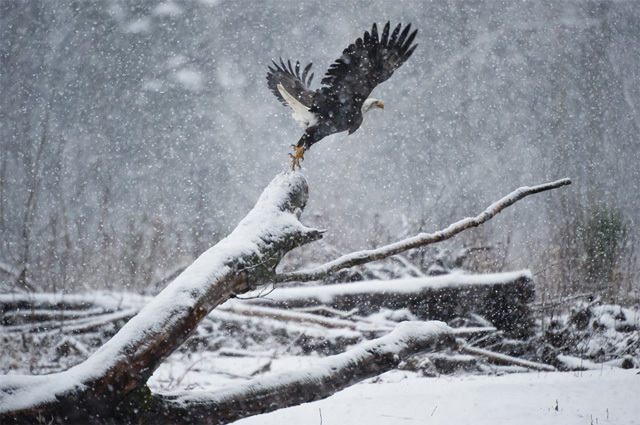 Although it is a little early in the viewing season to see large numbers of eagles there are a few pairs of resident eagles as well as early migrating birds. This float is more directed at the scenic beauty of the Skagit, and the changing colors of the trees that the river takes a meandering path through. 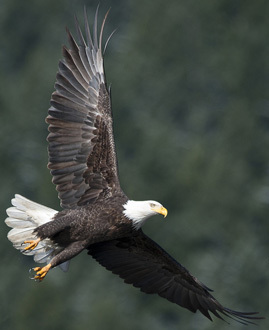 The majority of the Skagit Eagles begin showing up in mid to late November. 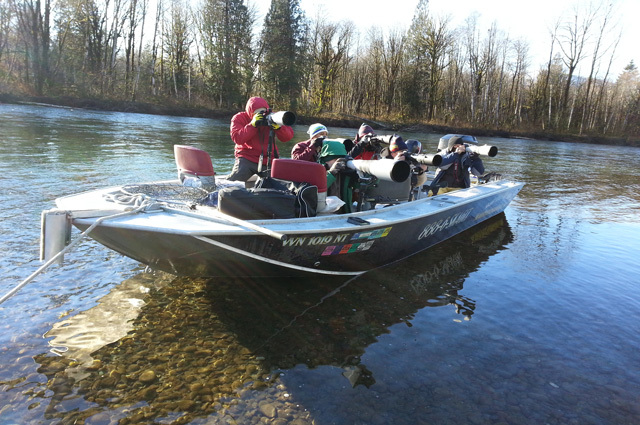 With a few fall colors still in view and salmon still in the river this is a great time to take an eagle tour. 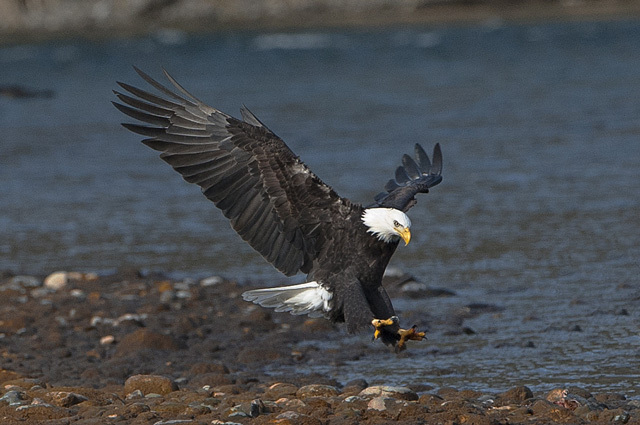 During the early season Eagle counts for a 3 hour float usually hover between 40 and 80 birds. The peak of the viewing is December and January with numbers topping 200 on many occasions throughout the season. There are still good viewing opportunities in February with numbers hovering in the 50ish range. Our last float for the year is usually in the last week of February. We have several different launch points for our tours, depending on what section of the river has the highest concentration of eagles. Early on in the season we are usually launching up river at the Marblemount boat launch as the season progresses we begin floating the lower stretches down as far as Concrete. 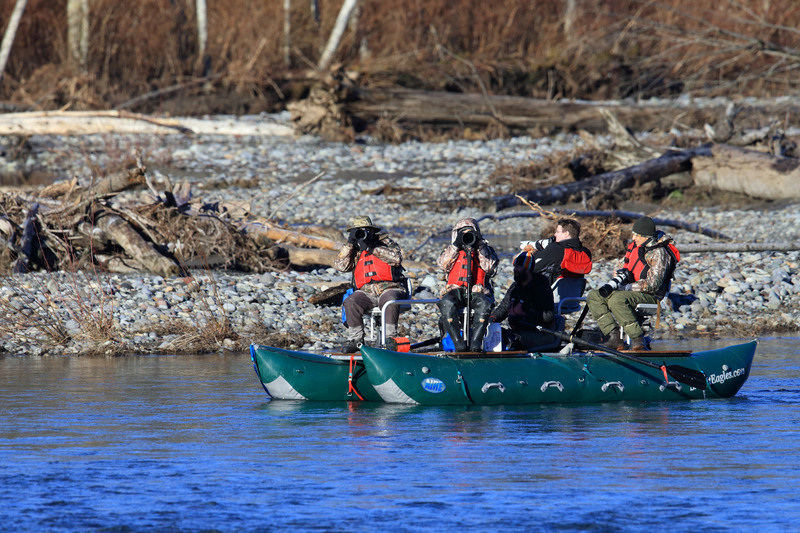 The Nooksack eagle raft trip is a higher energy float than the Skagit, but with alot more to offer the photographer or nature lover. The Nooksack is a lot smaller river than the Skagit and the only way we can offer tours on it is by using a catamaran style raft. Depending on the the river level you may have to step out of the boat and wade through shallow water for a short distance. 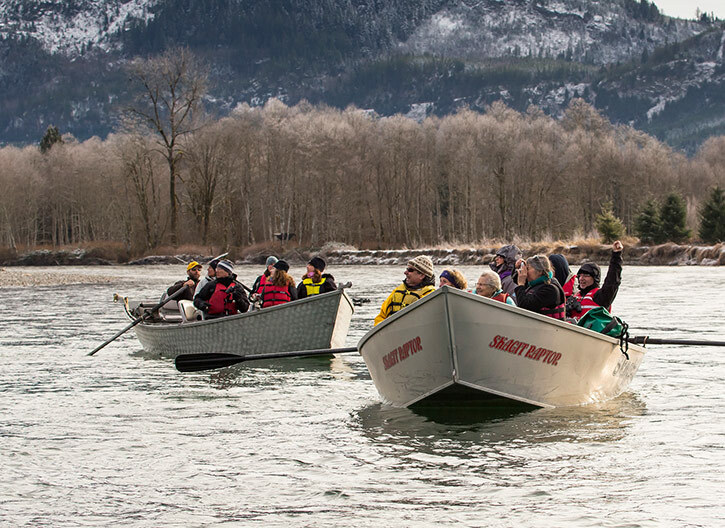 (Rubber boots are a must on this trip) This Nooksack eagle tour will require the clients to be able to help drag the raft a short distance and be comfortable with walking in ankle deep water. The Nooksack Tour will be a very different experience from the Skagit as there is a few short stretches of mild white water as well as narrow river channels. This tour requires a minimum of 3 people and has a maximum of 4. The Skagit may be renowned for the Bald Eagles, but the Nooksack has higher numbers every year and we are happy to be the only outfitter operating on the upper section of this system. When you Book A Trip with us we will send you easy driving directions to the boat launch via email or mail along with our confirmation letter. 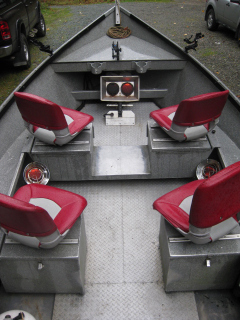 Upon arriving at the meeting place we will then transport you up river to the launching point where we will get the boats in the water, the propane heaters turned on high and the Hot Cocoa ready to serve for the trip. The tour takes 2.5 to 3 hours. To make reservations or purchase a gift certificate you can give us a call on our toll free number, email us or use our online paypal account. Don't forget to enter our Photo Contest! The winner will receive a full day private Photo tour.